A teacher high in the mountains with the GRN Good News booklet. She teaches in a rural school. 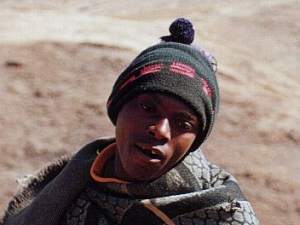 The local people call the Drakenberg Mountains of Lesotho the Roof of the World, though this is only the highest place above sea level in Southern Africa. Here, shepherd boys walk long distances high up in the mountains to herd their flock. Evangelism materials in this part of the world should be the lightest to carry, the strongest to last and to withstand very low temperatures. 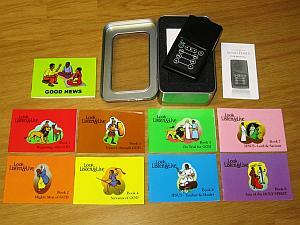 Sometimes the voice on the Envoy Micro, Storyteller or AudiBible player is the only voice the shepherds will hear in weeks or even months ... Who counts the days? 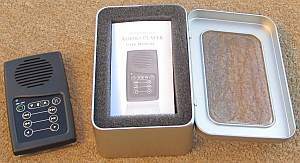 The Megavoice Envoy player is distributed in a metal container for protection. The Megavoice player is the same size as the GRN Pocket books, which means they all fit together in this protective container. 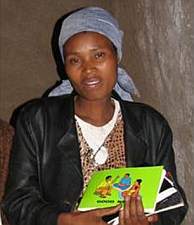 You can help to equip a Basotho shepherd with the Word of God to accompany him when he has no other company in the cold. If you know any people from this area, or are planning a trip to Lesotho, please click here to contact GRN Southern Africa. You can donate by clicking the button below, designating your gift 'Lesotho - Roof of the World Project'.